PennEast Pipeline Company LLC: The “oops” company. PennEast has made statements in lots of different media: public and private meetings, FERC submissions, newspaper articles, letters to the editor. And it’s simply astounding to me how many mistakes, errors, gaffes, and outrageous missteps they’ve made in all of them. There isn’t any one spokesman or employee that’s been messing up. It basically seems to be all of them. One of their most recent epic-sized faux pas is in the area of co-location. This is a hot topic. Co-location is generally seen as a good thing and gets pipeline companies brownie points with some people. So naturally PennEast crowed to the rooftops when they made their route change in January and claimed they were now co-located for most of the route. The big change was in NJ where they co-located along an existing JCP&L power line easement, bringing them up to 60% co-location in the state. Still PennEast persisted and said that they were co-located. They proudly presented this fact even to the NJ DEP – who promptly said that even 60% wasn’t enough. Apparently someone at PennEast finally woke up and actually looked at the construction plans, and then looked up the definition of co-location (or maybe FERC reminded them). And saw they had made a HUGE mistake. It’s finally documented in their most recent set of resource reports from last week. Here you can see PennEast now admitting that only 36% of the total project is co-located, with 39% in NJ and 35% in PA. 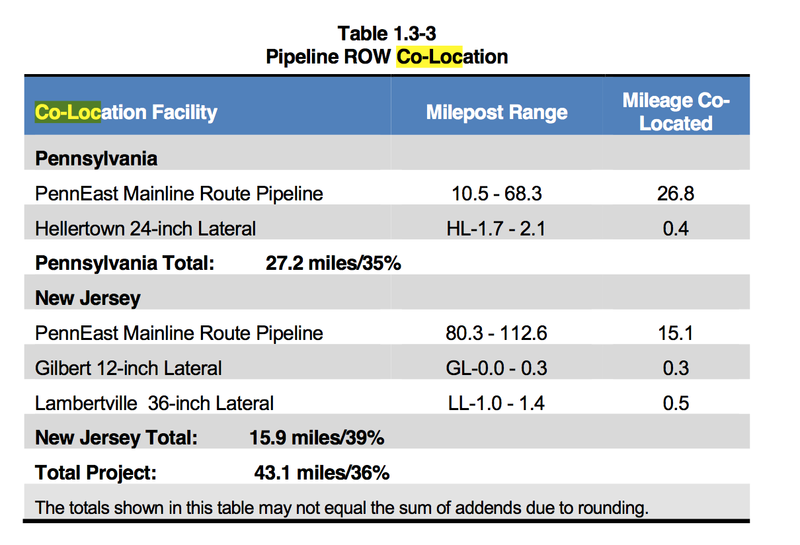 Meaning that PENNEAST ADMITS THAT NEARLY TWO-THIRDS of the route is NOT CO-LOCATED. This is yet another epic fail from PennEast…and serves as yet another one from a long list of them. When are they going to figure out that they’re just not capable of building this pipeline and give it up?